The two-kilometre-long Corso degli Inglesi is one of the most beautiful and serene residential streets of San Remo. It is lined with villas dating back to the 17th and 18th centuries and mostly belonging to the British people. The spectacular architecture and the aristocratic gardens covered with flourishing fruit trees which characterise Corso degli Inglesi are still able to fascinate the eyes of a modern tourist. During this walk you will see many impressive architectural structures, of particular interest are those of the Art Nouveau style, or as it is more commonly known in Italy, Liberty style. Privacy is a sacred thing here, and it is impossible to see the interior of these homes, as they are all privately owned. However, from the outside, you are still able to admire the residential flavor that defined an era of San Remo. Villa Bel Respiro is a 19th century neo-renaissance building, which nowadays is site of the Experimental Institute of Floriculture. 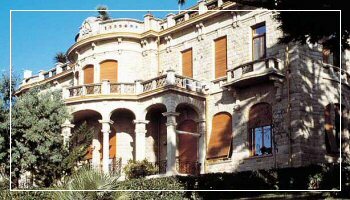 Villa Vista Lieta was once known as Villa Agnese after the baroness Agnese di Groppello, wife of the first owner, the Englishman Dairjmpie. Villa Vista Lieta was sold in 1912 to the English merchant Boyd, who embellished it with several works of art, including a reproduction of the famous “Amore e Psiche” by Canova. In 1931, it was inherited by his daughter Daisy, who, three years later, donated it to the Italian Government, at that time lead by Benito Mussolini. The Duce then allotted it to the army as an estate for the discharged soldiers, which is still its current function. Castle Devachan is famous for having been defined by the poet Gabriele D’Annunzio as “a huge villa in poor taste”. The castle was commissioned for construction in 1905 by the English Earl of Mexbourough who had lived in India for 30 years and converted to Hindu. Hence its name “Devachan” means “Paradise Door” in Indian. It has maintained its original outer architecture. Villa Virginia is uniquely Liberty in style, whereas Villa Fiorentina, with its stonewalls, the wooden roof, and the wrought iron decorations, draws back to the Florentine Renaissance. To end your walk, take the street leading to the Casino from the intersection with Via Nuvoloni. You will notice an imposing yellow building with elegant Art Nouveau lines: the former Savoy Hotel, one of the largest hotels in San Remo which gave world fame to the town. In recent years, its fame has been linked to the suicide of Italian singer Luigi Tenco who shot himself after his song was rejected by the jury of the Song Festival.